In 2018, the Alter-Ciné Foundation received 82 documentary submissions from 32 countries. A $10,000 award is granted to the Argentinean filmmakers Loreley Unamuno and Malena Bystrowicz for their project Migrantas (Migrant Women). Twelve years ago, Maria left her rough mining region in Bolivia and traveled to Buenos Aires. Her plan was to work for six months to save money, so she left her three young daughters behind. But as the months passed, Maria was caught in a struggle to simply survive in Argentina where, in addition to being poor, she was a foreigner, isolated and homesick. Lourdes is another Bolivian migrant living in Buenos Aires, survivor of a deadly fire in an illegal clothing factory. “The clothes we wear are stained with blood,” she says. The fire took the lives of four children and a pregnant woman. Lourdes testified in the trial that followed, and she still fights to make sure that those responsible will be held to account. Ten years after the fire, Blanca started the Copacabana textile cooperative, which she now heads. Sixty women work there, participating in the management, sharing responsibilities and benefits. Working conditions are decent, safe. Three Bolivian migrant women in Argentina are ready to talk about their years of servitude and abuse. This is their story. Hamed Zolfaghari, recipient of a 10,000$ Alter-Ciné Foundation grant. A second $10,000 award is granted to the Iranian filmmaker Hamed Zolfaghari for his project Eye of the Desert. Shafie Abad is a small desert village in South Central Iran where traditions are fundamental. In this desert area, it seems that little has changed in decades. But one day, six young women are given cameras. They learn to use them and start a struggle to improve their daily lives. Enthused by its success, the group creates a cooperative for their handcrafts and films the process while they tackle issues of social freedoms and traditional restrictions. It becomes the starting point of a collective action, a cooperative of filmmaker/weaver women who free themselves. Through the handheld cameras, they discover their thirst for freedom and learn to change their conditions by changing their point of view. But their work stirs controversy in the otherwise sleepy village and the women are confronted with an outcry against their filming from conservative community members. Michel K. Zongo, recipient of a 5,000$ Alter-Ciné Foundation grant. A $5,000 grant is awarded to a Burkinabe filmmaker, Michel K. Zongo, for his project No Gold for Kalsaka. Twenty years ago, the government of Burkina Faso granted licences to several multinational gold mining companies. It was the start of a boom, a true goldrush. The first open-cast mine began production in 2006, at the small town of Kalsaka. The plan was to take out 18 tonnes of gold over ten years. But the shine soon came off the project, and after six years, the company closed its doors, leaving behind an environmental and social disaster. This is what filmmaker Michel Zongo will lay bare as he follows Jean-Baptiste, a civil society activist, his entry point into Kalsaka and the reality of its 3000 inhabitants. Born in Kalsaka, Jean-Baptiste has watched the catastrophe play out before his eyes. The film reveals the determination and courage of men and women fighting for their rights and, above all, their dignity. Nishta Jain, recipient of a 5,000$ Alter-Ciné Foundation grant. A $5,000 grant is awarded to an Indian filmmaker, Nishta Jain, for her project The Golden Thread. The Golden Thread is a journey to the antiquated jute textile industry along the river Hooghly at the outskirts of Kolkata. Time came to a stand-still here a long time ago. Century-old factories still function, even as their counterparts in the west shut down half a century ago with the arrival of plastic fibres. History resides in every nook and corner –in the rusted jetties; brick chimneys that sprout trees; mossy walls with thick layers of trade union posters reminiscent of a time when labour still had a say in the running of the factories; last but not the least in the faces and bodies of the workers that have toil and strife embedded on them. 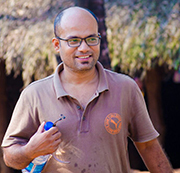 Sourabh Kanti Dutta, recipient of a 5,000$ Alter-Ciné Foundation grant. A $5,000 grant was awarded to an Indian filmmaker, Sourabh Kanti Dutta, for his project Khusbutola. In the red-light area of Forbesganj, a small town along the Indo-Nepal border, lives a community called the ‘Nat’. They keep an odd tradition. ‘Nat’ men prostitute their women – wives, mothers, daughters. Fatima’s husband was a pimp, too. She was forced to marry him when she was 9, but refused to carry on this tradition. After having 6 children, she walked out of marriage. She made sure that her children get education. Not content, she continues to motivate, fight for other women, children there. But the nexus between pimps, traffickers and police continues to frustrate her efforts. Meanwhile, her quest for love and emotional security took her to Asif, new man in her life. But with love, comes pain! Wrecked in personal life, she picks up pieces slowly and with other women, aims for what seems impossible – to uproot prostitution/trafficking from there.